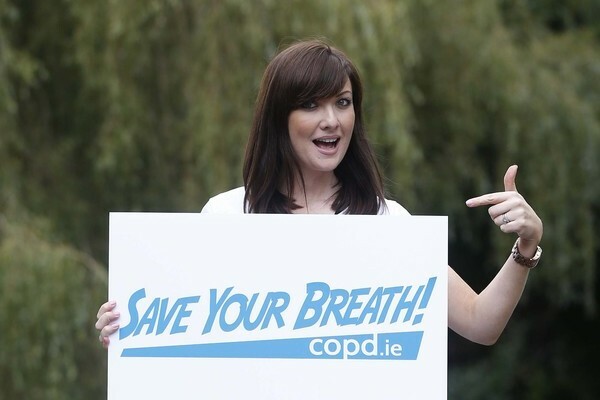 Jennifer Maguire, pictured lending her support to the “Save Your Breath” national COPD awareness campaign by COPD Support Ireland. COPD Support Ireland has launched Save Your Breath, a national campaign to raise awareness of Chronic Obstructive Pulmonary Disease, in association with Novartis, GSK, Menarini and Boehringer Ingelheim. National COPD Awareness Week will run from the 17th to the 23rd of November, with a roadshow visiting Stephen’s Green on Wednesday the 19th to mark World COPD Day. Running from 11am to 3pm, the roadshow will be giving out free information and advice on the disease, with a respiratory nurse on hand to answer any questions people may have. COPD is the third-biggest killer in Ireland, behind cardiovascular disease and cancer. Almost 500 people in Dublin alone died from the disease in 2013. Despite these figures, many are not aware that they have it, and as early detection is key to ensuring quality of life, this campaign aims to help people identify its symptoms, and encourage them to visit a doctor if they have any concerns. According to Consultant Respiratory Physician Professor Tim McDonnell, “We know that there are people living in Dublin with COPD who have no idea that they have the disease and are therefore not being treated for it. This campaign is about encouraging people to know the symptoms and to take the next step and visit their doctor to organise a very simple, quick and painless lung check, known as a spirometry test. Early treatment can make a big difference. 1. Do you cough several times every day, several days of the week? 2. Have you been coughing like this for more than three months? 3. Do you cough up mucus (phlegm) most days? 4. Do you feel breathless from physical work or moderate exercise? 5. Are you a current or former smoker? 6. Do you work, you have you ever worked, in an environment where there is exposure to pollution, fumes, dust or smoke? 7. Is there a history of lung conditions in your family? 8. Are you over the age of 35? Visit the COPD Support Ireland website for further information. A full list of locations that the roadshow will be visiting can be found here.